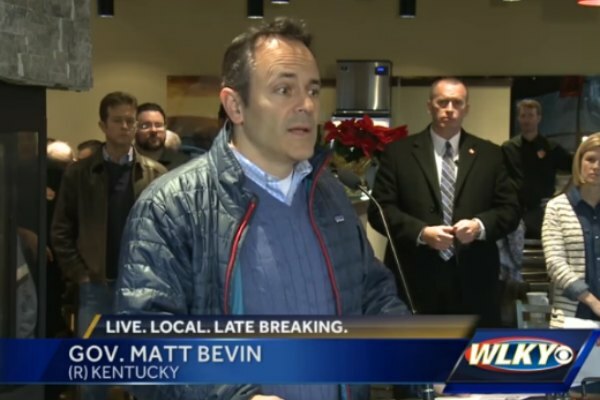 Kentucky Governor Matt Bevin, a Republican, has sided with a printing company that refused to print t-shirts for an LGBT group. Bevin has submitted an amicus brief to the Kentucky Supreme Court in support of Hands On Originals, the Lexington printing company that in 2012 refused to print t-shirts for Lexington's Pride Festival, the Lexington Herald-Leader reported. Citing his Christian beliefs, co-owner Blaine Adamson refused the order from Lexington's Pride Community Services Organization (PCSO), which organizes the annual event. PCSO filed a complaint with the Lexington Human Rights Commission, which ruled that Hands On Originals had violated a city ordinance that prohibits discrimination based on sexual orientation. Adamson was ordered to get diversity training. But a state judge overturned the ruling and an appeals court affirmed the decision. The commission appealed the ruling to the state's highest court. Bevin's lawyers argue that requiring Hands On Originals' owners to print t-shirts “promoting homosexuality” would violate the Kentucky Constitution's religious freedom and freedom of conscience guarantees. Hands On Originals' owners argue that they object to the message that there is “pride in being gay,” though the shirt they refused to print only says “Lexington Pride Festival” in rainbow colors.